I once heard that if you keep your feet warm, your body will eventually be warm as well. Actually, it was my mother who said that, and I have no idea if it’s true. Still, for all those who don’t want to have cold feet (literally), then you might want to invest in Columbia Bugathermo boots. 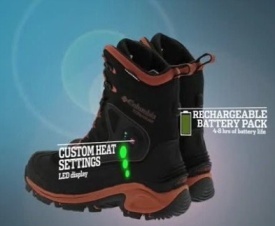 These boots have built-in rechargeable batteries that can heat them up for four to eight hours. So I suppose you could call this an electric blanket for your foot, or the only true leg warmer. It has three settings that are located conveniently at the ankle. As for the charging, you just plug them in and forget about them. I don’t know why they call them Bugathermo, that just sounds like a bug with thermite in it. You should be able to get these Bugathermo heated boots on the Columbia Sportswear website in Black and Cedar for about $250 in varying sizes. As a side note, I have seen the Bugathermo boot on many other gadget sites. Most of them are very negative to the idea of a heated boot, but I think it’s the price that scares them away. Now, if they could put this tech on a ski boot, you might attract a whole different audience. The ski boot technology is made by Hottronics. They’re awesome. I just tried some of these boots out in 18 degree Madison weather. Pretty sweet. I would buy these in a second if they had a women’s model (not the high boot “fashion” style). Come on Columbia, just make a few smaller sizes!